Back in 2006, state officials and providers in California were alarmed by the rising maternal mortality rates being reported nationally. The problem was California didn't have the data to understand how the issue was playing out in its own state. There was no uniform system tracking maternal mortality. 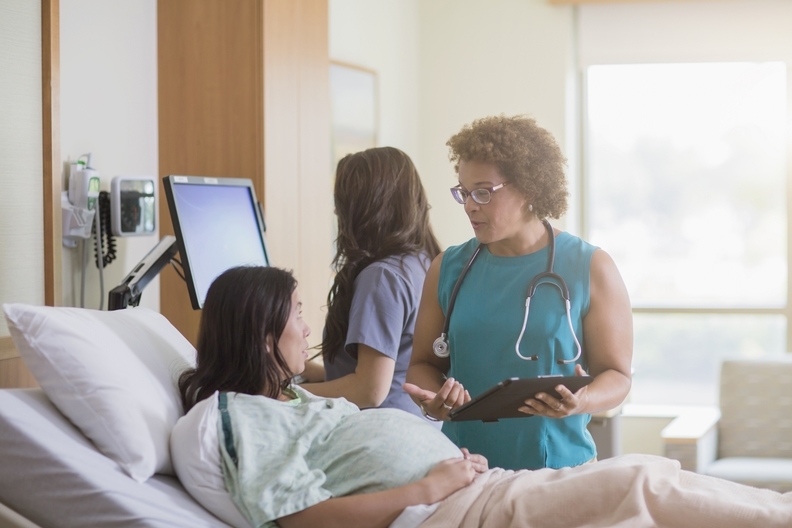 So, with grant funding, the state formed a review committee called the California Maternal Quality Care Collaborative that has played a critical role in state efforts to reduce maternal mortality. Since the California committee was formed, the state has seen maternal mortality decline by 55% from 2006 to 2013, from 16.9 deaths per 100,000 live births to 7.3 deaths per 100,000 live births. More than 200 hospitals are part of the collaborative, and they follow guidelines from toolkits that explain how to identify and treat various maternal complications. Maternal health experts say lowering the nation's rising maternal mortality rate would require the type and quantity of data and information California has been able to collect through its review committee. Each state faces unique circumstances that may be leading to poor health outcomes for pregnant women, so providers need to be armed with that information to form real solutions. Unfortunately, the U.S., up until recently, has neglected vigorous data collection on maternal mortality. The federal government underreported the issue from the 1980s to the 1990s. “In the absence of national reporting of overall statistics, I think that maternal mortality didn't get the attention that it needed,” said Dr. Lisa Hollier, president of the American College of Obstetricians and Gynecologists. Pregnancy-related mortality in the U.S. has risen from 17 deaths per 100,000 live births in 1990 to 26.4 deaths per 100,000 live births in 2015, according to a 2016 Lancet study. As public outrage about the nation's maternal mortality rate has grown in recent years, so have efforts by hospitals, states and the federal government to improve data collection and work toward solutions. Though not all states have committees like California's, recent figures show interest is growing. It's estimated about 35 states have such committees, up from 29 last year. At the federal level, the CDC has partnered with the CDC Foundation and the Association of Maternal and Child Health Programs since 2016 to improve maternal mortality data collection. Through the partnership, the Maternal Mortality Review Information Application was created. State maternal review committees employ the data tool to standardize their data collection, so the CDC can use that information for analyses on prevention opportunities. Before the tool was available, it was challenging for review committees to share their data easily because they all reported it differently. “When you have a system like what existed before that is nonstandardized, you are unable to do the type of analyses and come up with the type of recommendations that is key for public health,” said Dr. Judy Monroe, CEO of the CDC Foundation. This year, the CDC issued a report using information from nine states that have adopted the data collection tool. The report outlined several recommendations to prevent specific causes of maternal deaths. The CDC partnership also developed a web-based resource for maternal review committees called Review to Action. The site offers committees access to the database as well as the opportunity to share best practices with other committees on data collection and analysis methods. “It allows these state-based teams to be able to share their experiences and work toward solutions,” Monroe said. The concept of maternal mortality review committees isn't new. While such committees have existed for decades, they weren't widely used until recently, and it's hard to find funding to form new ones, Monroe said. The committees, which are typically funded by state grants, identify all pregnancy-associated deaths and causes in the state through a detailed evaluation of various documents including death and birth certificates, and prenatal care, hospital and autopsy records. Committee members are usually volunteers and typically have backgrounds in obstetrics and gynecology, nursing, midwifery, forensic pathology and social work. The review of one case can take several hours. Typically, the committees present their findings to hospitals, so they can look for opportunities to improve. California's committee took it one step further and acquired grant funding, initially from the CDC, to create quality-improvement initiatives that help providers identify and treat the leading causes of maternal death. Member hospitals pay an annual fee to be part of the collaborative, which includes support from experts to adopt the toolkits. The collaborative is now entirely funded by grants and membership fees, said Cathie Markow, administrative director of the California Maternal Quality Care Collaborative. Two federal bipartisan bills in the House and Senate are pending that would establish funds and provide support so all 50 states can have a maternal mortality review committee. Hollier at the ACOG said she is hopeful the bills will pass soon after Congress returns from its August recess. West Coast health system Providence St. Joseph Health has realized a number of benefits since it started using some of the collaborative's tools five years ago. Providence St. Joseph had gathered front-line staff to examine its maternal mortality data, finding mothers were most frequently dying from hypertension, hemorrhage and sepsis. The team then scoured the literature and evidence-based practices available, landing on toolkits from the California collaborative. “There is a huge amount of medical knowledge out there, and it's just not implemented,” said Dr. Amy Compton-Phillips, chief clinical officer of Providence. The practices have since been put in place across all 51 of the system's hospitals. Compton-Phillips said access to the clinical outcomes data empowers staff to keep focused on the practices, which are detailed and time-consuming, like nurses weighing sponges to measure blood loss. The health system, which delivers about 67,000 babies each year, reported zero maternal deaths last year. Yet, Providence won't stop, and will expand its efforts beyond labor and delivery practices. Evidence shows that women who are healthy before pregnancy and receive recommended prenatal care will have safer deliveries and strong babies. Taking this into account, at annual exams and primary-care appointments, Providence asks female patients if they plan to become pregnant within the next year. If so, recommendations are given to improve health like taking certain vitamins or losing weight. “It's a lot easier to have healthy moms and babies before they get pregnant,” Compton-Phillips said. The problem is some women only have access to healthcare—particularly certain Medicaid members—because they are pregnant. The coverage usually expires 60 days after delivery. Further, women who are poor are more likely to face challenges that prevent them from having healthy pregnancies, such as limited access to nutritious food or prenatal care. About 50% of the babies Providence delivers are from mothers on Medicaid, which reflects national trends. “There are a whole slew of social factors that impact health outcomes and that plays a role when we are talking about higher complications in pregnancy,” said Dr. Rose Molina, an OB-GYN at Beth Israel Deaconess Medical Center in Boston who has written about maternal mortality. To identify women at risk for such complications, Providence has set up a tool in its electronic health record. Various questions about the mother's circumstances are documented and depending on the responses, physicians will be alerted when extra precaution should be taken. While care practices before and during pregnancy are important, so is care afterward, ACOG's Hollier said. Women can die from pregnancy-related reasons up to about a year after labor. To address this, the specialty society in May updated its guidelines for postpartum care. Instead of a one-time checkup six weeks after delivery, obstetricians are encouraged to contact mothers within the first three weeks postpartum and provide ongoing follow-up care as needed. “What this does is it really emphasizes the need to ensure that the woman is getting the right healthcare for her specific situation,” Hollier said. The guidelines also help to ensure women on Medicaid because of pregnancy get the appropriate follow-up care before they lose access. The ACOG is also working on guidelines to address women's long-term risk for heart disease after pregnancy. Hollier said more women are dying from cardiac issues, while deaths from hemorrhage and high blood pressure are falling. The ACOG expects to have the guidelines released by May 2019. “Women who have pregnancy complications like pre-eclampsia or diabetes have an increased risk of developing heart disease later in life. We want to better identify these women and how best to take care of them,” Hollier said.